A mixture of various elements that appeals to fish’s senses. The first element is the fly rides hook up and has the wing and flash like a Crazy Charlie. 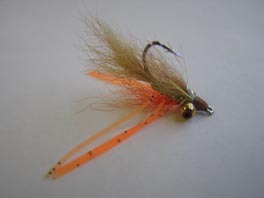 The next element is the Clouser style tail, and hot orange under wing that represents a sand crab or shrimp’s egg sac. The last part is the Silli legs tied in like a crab fly to give the fly added motion. This is a great fly to fish for Corbina, Halibut and Perch.